Although I am not quite ready to start wearing boots full time because it makes me think about snow, I did however, wear a pair last week. I also wore my little black suede booties which I prefer because they are uber cute and comfortable. 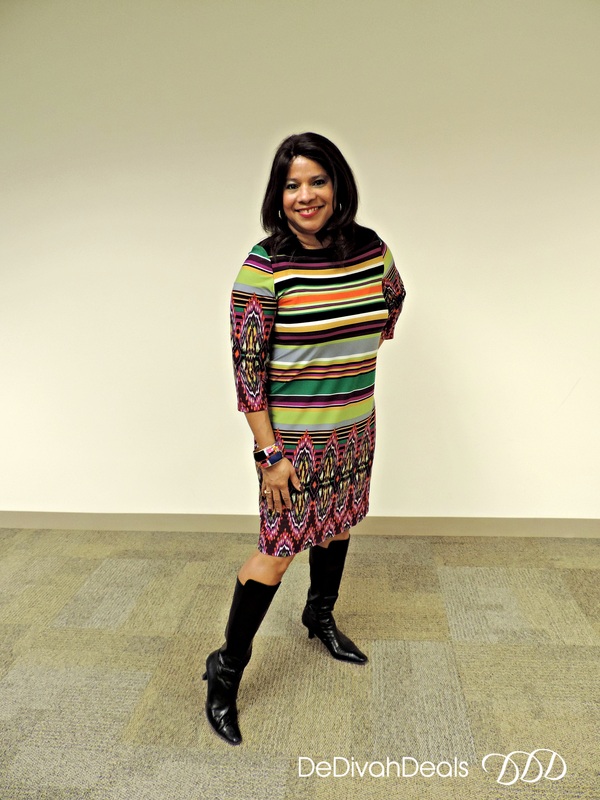 This colorful striped dress was thrifted from Goodwill and not only do I love the wonderful colors but also that it is forgiving. It hugs where it’s supposed to and it’s loose where it needs to be! I chose to wear a multi color bracelet but now that I see this pic, it appears lost! I normally wear silver tone jewelry with black so with this outfit I have on silver hoop earrings, multi-strand silver tone necklace, silver cuff bracelet and zebra stripped silver ring and watch. Next week I will be wearing my blue suede booties of which I have two different pairs so stay tuned for those outfits of the day. How about you, what do you like better, over the knee boots or do you prefer to wear booties? Happy Thanksgiving – eat, drink and be merry!!! Love the outfits on you especially that colorful dress. The booties are perfect on you so wear dem. . . Enjoy your holi-daze one by one . 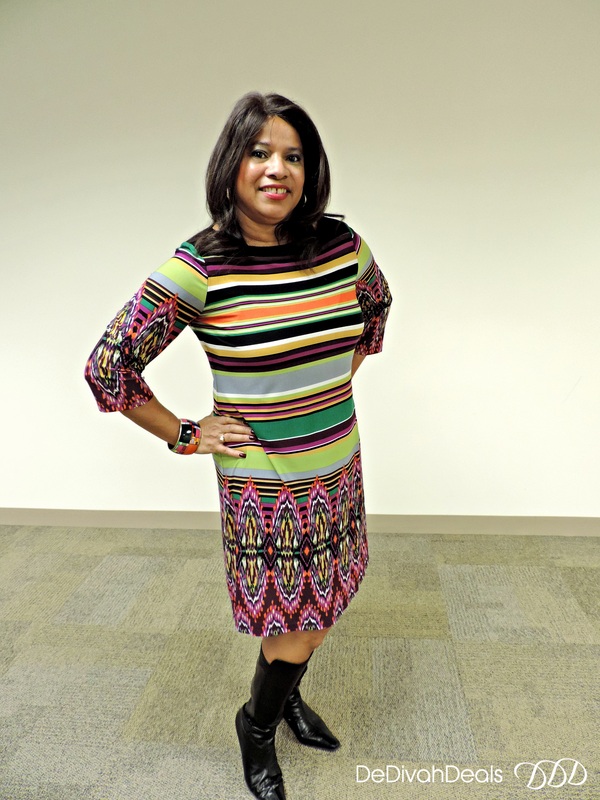 Thank you blog sistah – HAPPY THANKSGIVING!!! I love the booties the most! They really can be worn year round which is why they are a personal favorite of mine! My thoughts exactly, I wear those suede booties all year round! HAPPY THANKSGIVING. Thank you Lisa – eat drink and be blessed! Thank you and I hope you had a wonderful Thanksgiving as well. I like your boots and your booties. I have never owned a pair of booties, but I want a new pair of shoes for Christmas . I think I’ll try something new and get a pair of booties. I think you love them as they are versatile, you can wear with dresses, pants and jeans. You look fabulous in both outfits! Cute booties as well! Thank you, but the time has come to …dare I say it…put on tights!!! !